How to view version history, compare versions and switch to older versions in Writer? Document revisions simplifies the way you use version history and make it easy for you to see the changes over time. This is your one-stop hub to keep track of all that's happened in your document since you last visited. You can also view different versions of a document, download an older version, switch to previous version, bookmark a particular version and much more. Version history helps you keep track of all of the edits that were made in your document. You can see what has changed over time, easily. Click on the dynamic icon, next to the document name, notifying when the last edit was made. This will take you to a page where all versions of your document are listed. Click on "See what's changed" icon at the top. Clicking on it will enable you to view the changes that were made for the day, over a week and over a month. You can also customize a specific period to distil out edits that happened within that period. It can be useful to keep multiple versions of the same file, so you have a record of the changes you've made. Click File > Create Version. A pop-up window will appear. Enter a short description and click Create. Note: To access an older version of the document, go to File > Document History. All versions will be displayed in the right side of the screen. Keep track of all that's happened in your document since you last visited. All the changes will be color-tagged, so that you can see who changed what. Click on View changes since your last visit link next to the Compose mode. The changes made by other users will be highlighted. The changes will be color-tagged for each user and you can keep track of what each user has modified in your document. You can review different versions of your document and restore to an earlier version, if required. Choose any version from the versions panel. Click the Restore this version link, so that your document will be set to the version you choose. Click icon and choose to Print or Download the particular version. 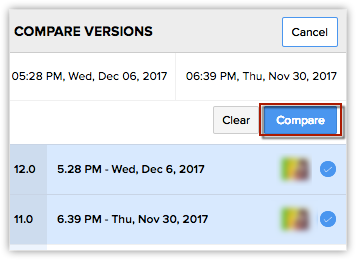 Select any two versions and compare the changes that has been made by all or specific collaborators. Keep track of changes and also revert to a better version, if required. Click compare versions link from the versions panel. Now select any two versions and click Compare. Also, filter among collaborators to see the changes done by specific users.